A made to measure bespoke Garage / Workshop measuring 3.04m x 4.57m (10'x15'). This building is manufactured from 22mm cladding on our standard heavy duty framing. We build our garages, where possible to fit exactly to the concrete base so there is a lip running all around the building effectively sealing out any ingress of the weather. All our sheds, workshops or garages are manufactured in our own workshops to the highest of standards in the old fashioned way. Each building is lovingly hand made by trained carpenters with selected, 5th grade redwood cladding on a substantial heavy duty frame. 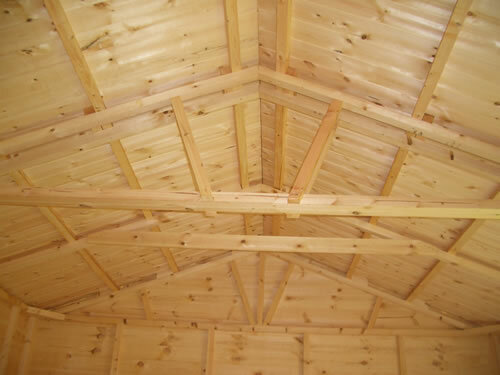 Every building is made specifically for a customer on order and is tailored to your own individual requirements. Heavy duty framing of 2"x2" (50 x 50mm) as standard with top and bottom rails of 2"x1½" (50 x 38mm).the timber is of a high grade and planed smooth. Clad in 12mm 5th Grade Tongue and Grooved Shiplap, well seasoned Swedish red wood pine to ensure relatively knot free boards. An option of 22mm cladding is available if required as is Tanalising. The boards are secured to the framing by high quality galvanised nails. Roofs are manufactured from 12mm tongue and groove boards of the same quality as our cladding ,an exterior grade 11mm O.S. Board is also available at no extra cost should you require this. Our roofs are then covered with 20kg green roofing felt as standard however a higher quality, heavy duty felt is available as are also felt tiles. Roofs can even be adapted to take heavier coverings such as clay pan tiles. Windows: All our windows are hand made in the old fashioned way using mortise and tennon joints and secured with high quality wood glue and star dowels. Each window has drip sills under the glass. The glass is beaded with mitred beading on a bed of silicone. Double glazing can also be supplied if required. 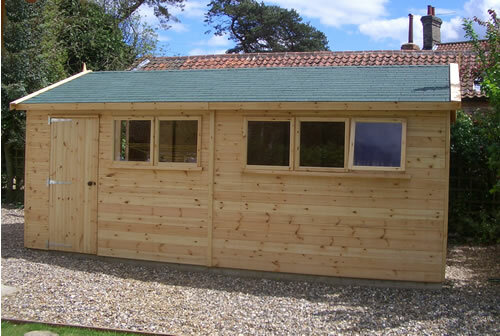 If you are interested in a bespoke shed then please contact us to discuss your own requirements such as the layout of the building, as many permeations are possible. You may have additional requirements such as alternative cladding, security hinges, double doors, stable doors, heavy duty locks, security windows or skylights. Several other options are also available; strengthened floors, partitions, and even roll on - roll off roofs. We specialise mainly in bespoke buildings. 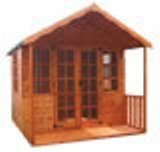 If you would like to have a building built to your dimensions or specifications whether it be a small kennel or a 6 bedroom log cabin then please contact us to discuss your requirements. The Classic open pergola is ideal for use as a hot tub cover or outside dining area. Measuring 14'1"x14'1"
A Hi-eaves traditional style apex shed 1.22x1.22m available with various door configuration options. The Chatsworth summerhouse a useful garden building with plenty of internal light. 1.83x3.66m. Hayter Spirit petrol push lawn mower featuring lightweight chassis and low emission Briggs and Stratton engine. Swan Hanging Basket Bracket 13"